In December 2002 the first rumors about an USB Cartridge Reader spread on the MSX Resource Center. An USB Cartridge Reader is a device that can be connected to a PC by a USB cable. After inserting an MSX ROM cartridge into the device, the software on the cartridge can be played on an MSX emulator. The first and (at the moment) only emulator to support this device is, of course, MSX Association's official MSX emulator: MSXPLAYer. Five months later the first prototype of the USB Cartridge Reader was spotted, but it took until October before the name of the device was changed into MSX Game Reader and people could start pre-ordering the device in ASCII's MSX Store. Several months later, more than 3.000 MSX Game Readers were pre-ordered and production started. 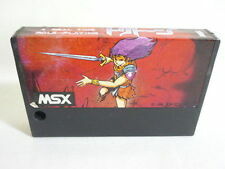 Today, April 20th 2004, MSX Resource Center received their MSX Game Reader. Time for a review! 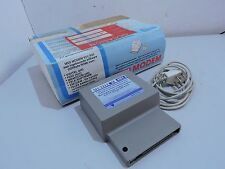 The MSX Game Reader comes in a white box containing a manual, the Game Reader itself and a CD-ROM with drivers and a special Game Reader version of MSXPLAYer (previous MSXPLAYers don't support the Game Reader). The Game Reader is a lot smaller than I thought it would be, and is very well designed. Modeled like a small MSX computer (heavily inspired by the Panasonic FS-A1 series), it contains a nice flap where you can insert the cartridges. This flap makes sure your Game Reader will remain dust-free, whether cartridges are inserted or not. On the back of the Game Reader is a standard USB connector, the bottom of the Game Reader contains several dip-switches, which can be used to make the Game Reader act as Slot 1, 2 or even a subslot. By connecting more than one Game Reader to your PC you can even enjoy the extra options several Konami games give when inserting a certain game in Slot 1, and another one in Slot 2. A small light on the Game Reader shows whether or not a cartridge is (correctly) inserted in the Game Reader. Even though all software is completely in Japanese, installation of the driver and MSXPLAYer were very easy, as they use standard Windows installation software. In a few clicks the software is ready to go. After installation, two versions of MSXPLAYer are available: one with joystick support and one with mouse support. Connecting the Game Reader took me a ride to the local computer shop, as the standard USB cable was not included in the package. Of course this saves ASCII quite a lot of money, but as the price of the Game Reader was on the high side, I would have expected such a cable to be included. Windows XP instantly recognized the Game Reader (as I had pre-installed the driver) and then I was ready to go. Instantly after booting MSXPLAYer it started the game I had inserted in my Game Reader. Functionality appears to be the key of this version of MSXPLAYer, as it doesn't come with a graphical skin like the MSX Magazine versions. The benefit is however that a larger part of the screen is occupied by the 'MSX Screen' itself, which is of use to people who work at low resolutions. Both in windowed as in full-screen mode MSXPLAYer needs 640x480 pixels. The emulator can be reset and (a bit) tweaked with the menu settings. You can adjust the sound, accuracy, speed (low-normal-high-infinite) of the emulator and select one of the 3 virtual disk images or a real disk, which comes in handy when you play games that save on disk. The first thing I noticed was the emulator automatically switching between MSX1 and turboR emulation, the MSX1 boot screen and the turboR BASIC being adjusted a bit, showing the MSX Association copyrights. In the MSX1 mode the palette is quite close to the original MSX1 palette, which is probably the main reason for switching between MSX1 and turboR. Another reason for this switch could be reducing unnecessary system-load. I tried all cartridge games in my collection to see if I could spot a game that would not work correctly. None gave any problems whatsoever. Even my MegaFlashROM cartridge worked perfectly. It was nice to see that, when playing an original Konami game, the game was accompanied with SCC sounds, whilst running the same game in my MegaFlashROM cartridge (which does not contain an SCC) would result in a PSG-only game. The emulator actually checks if an SCC chip is available before emulating it. As the MSXPLAYer also runs disk images (provided that a cartridge is inserted in the game reader, without one the MSXPLAYer won't work), I tried to run Snatcher and SD-Snatcher, but in both cases the copy protection prevented me from doing so. It's probably a bit to hard to do decent 'real disk' emulation in Windows XP. I was a bit disappointed that I could not play these masterpieces straight from the original disks, but forgot about that as soon as I inserted Metal Gear 2: Solid Snake. Of course I could not resist to see what would happen if I would disconnect a cartridge during emulation: indeed, emulation instantly stopped and gave me a nice error message. When the game starts the background turns white and the screen is heavilly garbled. The D/A converter isn't emulated. I decided to try Hai no Majutsushi as well and that one does have the D/A converter emulated. That's why it was added to the list. The game starts with garbled screen. I get some sound which seems to be the speech. Later I can recognize the level which is run in the demo and MSX-PLAYer hangs from then on. BiFi, I don't know if you can or want to spend time on this, but I'd love to see a review of this thing. One side of me really wants one, the other side's rather cautious. Aside from that, what's wrong with 2 reviews instead of just 1? I've also seen the Gamereader running at Bussum. Sadly, there didn't seem to be any speakers connected to the pc that was demoing it so I couldn't hear the sound quality. My concern isn't the device - it's the emulator that comes with it. There's also no way to test MSXPlayer, since its commercial. 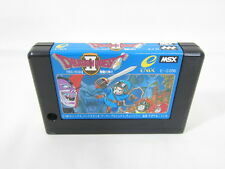 I've read the emulator chart - if its between NLMSX and ParaMSX I really don't know what to think - I like NLMSX's sound quality but that emulator isn't very smooth. ParaMSX was smoother but the sound isn't the best ever. The sound quality of MSX-PLAYer has nothing to do with the Game Reader. It sound quite well, though IMHO the noise register of the PSG is a bit too loud compared to the real thing. And as far as reporting games not working, there are many games working quite well, even SRAM is read (something I didn't really expect at all). If it also writes SRAM again when saving the game I don't know yet. Something I do miss a bit is forcing MSX-PLAYer to run on MSX1 with games being able to run on MSX1 or higher... It would be nice to see Nemesis 3 with those non-changing palettes for example. Ehr... Used a slot-expander with an (fm)pac and a game? Only the RuMSX emulator can do that. 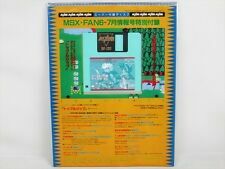 MSX Player could (and other old ones as well, maybe fMSX still can too?)... it was always a bit dangerous though, make sure to write protect the disks just in case... better to create a disk image of the original disk once and then use that. Anyway, MSX Player isn't very relevant nowadays, is it? Neither is the Game Reader, sadly.